Speaking for the proposition, surprisingly, was the NSPCC. 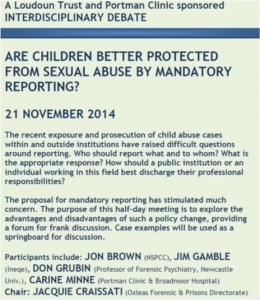 It was an odd choice of given the charity’s sustained hostility to Mandatory Reporting until just a few months before the debate when, as a result of increasing public pressure over reporting failures in ‘Regulated Activities’, it released a porous proposal for mandatory reporting in August 2014. This largely promoted the status quo in new clothes but included the magic word ‘mandatory.’ Until then the NSPCC had been welded to the ‘statutory framework’ authored within the Department for Education and which has been failing children, vulnerable adults and good staff for decades. This shift it seems, was partly prompted by the NSPCC realising it was likely to be on the wrong side of history and so, the ‘Strengthening Duties‘ initiative was magicked into existence. We replied to it here. Jon Brown (NSPCC lead for tackling sexual abuse) spoke for the proposition except he was reading a prepared speech at extraordinary speed. He also timed it to perfection – he was like a Swiss train except it was almost impossible to process what he was saying. Jim Gamble also spoke for the proposition and in contrast he had eye contact with his audience, was confident, engaging and framed his argument for the introduction of law very well. We all ‘got it’ even those who were against the proposition. Please note Ms McCrindle, who conducts research at the NSPCC, has incorrectly redesignated the gathering a ’roundtable discussion’ to aid, one speculates, her characterisation of the ‘impossible’ request we were making. Subject: RE: Loudoun Trust Debate – NSPCC transcript. I have recently been contacted by two attendees of the Loudoun debate at the Portman clinic. 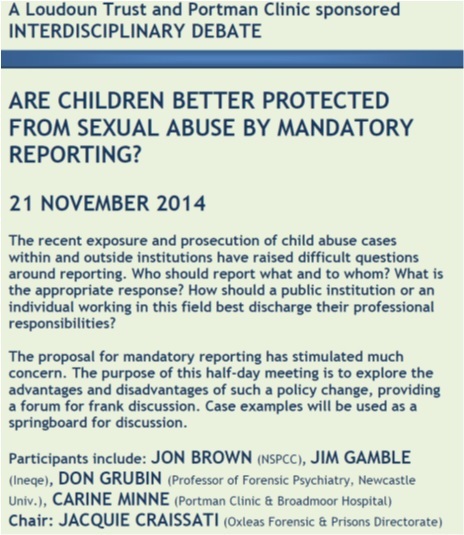 The second attendee said he found it impossible to take notes of the NSPCC contribution. What is the point of participation in a debate when we cannot understand what is said by the contributor, and then the contributor declines to provide a transcript of what clearly was a prepared and read speech? It makes no sense and it does not reflect well on your organisation. The impression given collectively by senior officials of the NSPCC is that you claim to be interested in dialogue on child protection policy issues, but whenever the dialogue might be with informed people who hold a view which differs from your own, that interest suddenly evaporates. You are welcome to correct that impression, firstly by providing a photocopy of Jon Brown’s notes of his Loudon Trust speech, and secondly by prevailing upon Peter Wanless to provide the information suggested in his email of 12 June so the meeting he suggested can finally occur. Ms McCrindle did not reply, and not a murmur from Mr Wanless.